Located in beautiful Lake Bluff, Illinois, Lake Bluff Elementary School has a rich history of building and preserving relationships with students and parents alike. Realizing that each student is unique, the staff at Lake Bluff Elementary School strives to provide its students with a positive academic, social, and emotional experience. Lake Bluff Elementary School District 65 has provided excellence in education for children for over 140 years. The district is 5.6 square miles in size with a 2014-15 student enrollment of 858 students in Pre-Kindergarten through 8th Grade. Most Lake Bluff Elementary School classrooms and administrative offices include several interior and exterior windows. The exterior windows provide high levels of natural light and classroom views of the picturesque rural surroundings. The interior windows also offer the benefits of an open design concept for students and staff. However, school administrators are also responsible for providing a safe, stable and innovative learning environment for Lake Bluff Elementary School students. Parents count on Lake Bluff Elementary School leadership to be prepared for any situation where immediate privacy is needed. The teachers and administrators of Lake Bluff Elementary also needed a proper means of conducting private meetings with parents and specialized testing without outside distractions. The large number interior and exterior windows throughout the school again posed a privacy challenge. Lake Bluff Elementary School needed a budget-friendly solution to their solar and privacy challenges. – All spring operated roller shades utilizes a spring loaded wooden rollers. The wooden rollers are capable of 120 lbs. of lift. – All clutch operated roller shades utilized a clutch and #10 stainless steel bead chain. – All room-darkening fabrics are NoLite Fiberglass, an opaque fabric with no view through. – All transparent fabrics are Mermet E Screen White/White with 3% openness. To address the school’s privacy challenges, Illinois Window Shade Company produced a total of 135 Illinois Window Shade Company Spring Operated Roller Shades fitted with room darkening fabric, which were installed on interior classroom doors and windows throughout the school. The room darkening fabric (NoLite Fiberglass White/White 0%) is totally opaque, blocking all view through. The spring roller offers a budget-friendly means to manually operate the shades. The shades are lifted and lowered by pulling on the bottom hem bar. Additionally, eight TRIMBUILT SD 1″ mini blinds were used for interior windows in the administrative office, per the school’s specifications. Illinois Window Shade Company Lake Bluff Elementary SchoolTo address the school’s solar control challenges, Illinois Window Shade Company produced a total of 76 Illinois Window Shade Company Clutch Operated Roller Shades fitted with transparent fabric. The fabric (Mermet E Screen White/White 3%) does an excellent job of reflecting solar heat while allowing higher levels of natural light into the interior space, thus improving comfort levels and energy efficiency. The fabric also preserves views of the school’s beautiful rural surroundings. The clutch used for the shades provides an easy, smooth lift. The shades are lifted and lowered using #10 stainless steel bead chain. Illinois Window Shade Company Clutch Operated Roller Shades are durable, simple to operate and look terrific. 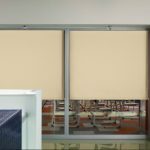 The Illinois Window Shade Company privacy shades are offering staff an additional security tool should an threatening situation arise where immediate privacy is needed to protect students in the classroom. Teachers are trained to utilize the shades when given orders over the school’s PA system. Meanwhile, the solar shades are providing a comfortable learning environment for students and an energy-efficient building for district leaders. Educational institutions and architects across the country are working to design sustainable solutions that provide enhanced security measures for school staff and students. The proper window shade addresses these challenges in a cost effective and practical manner. As a nationwide leader in window treatments, Illinois Window Shade Company provides the most effective window shade solutions available.